When you open files in the Photoshop Elements Organizer, the files are saved automatically to a catalog. The files aren’t really saved to the catalog; rather, links from the catalog to the individual files are saved. Links are like pointers that tell the catalog where to look for a file. When you open more files in the Organizer, the default catalog file grows. Working with a single catalog file has some disadvantages. For example, if your catalog file becomes corrupted and unrecoverable, you lose all the work you’ve done organizing files into keyword tags. Rather than work with a single catalog file, you can fine-tune your file organization by creating several catalogs. You might want to organize files according to subject matter, dates, locations, or some other division of categories, and then create separate catalogs for each category. Choose File→Catalog and click the New button in the Catalog Manager dialog box that appears. 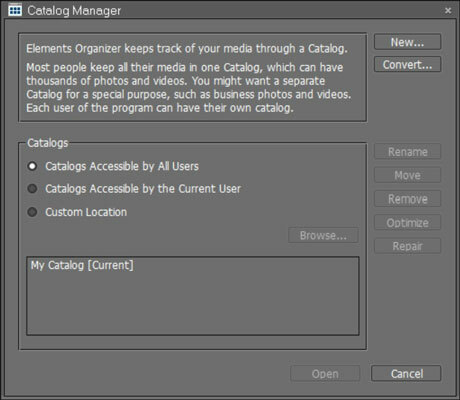 Choose File–>Catalog to open the Catalog Manager dialog box. Type a name for the new catalog and then click OK.
(Optional) If you want to add free music files installed with Elements, select the Import Free Music into This Catalog check box. Choose File→Get Photos and Videos→From Files and Folders to add files to the new catalog. When the Get Photos from Files and Folders dialog box opens, a list of media files appears in the dialog box when the Import Free Music into This Catalog check box is selected. (Optional) Select the free music files to add to your collection; then navigate your hard drive and select the photos you want to add. After you identify all the files, click Open. The selected music files and photos are added to your new collection of media contained in the catalog. Choose File→Catalog and select the name of the catalog you want to open. Click Open at the bottom of the dialog box to open the selected catalog. The Organizer window changes to reflect files contained in that catalog. If you can’t see thumbnail previews of images or open them in one of the editing modes, your catalog file might be corrupted. Click the Repair button in the Catalog Manager to try to fix the problem. When catalogs get sluggish, you might need to optimize a catalog to gain better performance. Click Optimize in the Catalog Manager routinely to keep your catalog operating at optimum performance.